My grandparents were farmers who, when we visited, involved us in the process of planting and harvesting. They were practical people, with a solid understanding of nature and the folly of rigid expectations. They planted, made sure they had done their best work, and accepted whatever results nature provided. Their common sense fed scores of relatives for decades. Fast forward to their granddaughter—that would be me—as I sat in my own vegetable garden in Oakland, California, dreamily pulling weeds. With each clump of dandelion or grass, I felt like I was letting go of some unresolved issue. I like to think of it as my Zen moment of gardening. Inhale, pull a clump, and exhale; inhale, pull a clump and exhale. By the end of an evening of weeding, I would be—excuse the pun—grounded. But I didn’t have my grandparents’ wisdom: whatever grows in the garden, after I have given it my all, is perfectly what is meant to be. When I think about it, that perspective is a metaphor for living. But back to vegetables. In my neighborhood, there were a lot of folks who had gardens overflowing with vegetables and fruit. One of my best friend’s garden was a cornucopia of kale, peas, asparagus, potatoes (red, white, and blue), squash, green peppers, tomatoes, and corn. She and her husband had spent years putting in the time and hard work to make their garden organic. Blackberries and raspberries circled their entire yard. And, oh yes, the apples really did hang low on the tree. A few years before learning from my friend about gardening, I had decided to grow some vegetables. In addition to the peas, tomatoes and lettuce, I thought I’d try some broccoli. 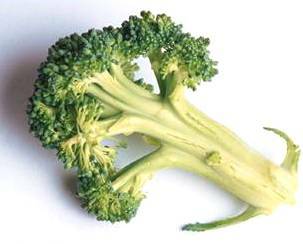 Broccoli, in my mind anyway, is a vegetable of perfection. It’s sweeter than leafy green vegetables and is easy to adapt for recipes. Little bites of the crown can be dipped in a variety of sauces. The whole stalk can be creamed for broccoli and cheddar cheese soup. Then there are the salads and–my all time favorite–tempura. I hoed, raked, and tilled. I mulched and fertilized. The vegetables grew strong and basically healthy, and the broccoli was dark green with stalks an inch thick. I purchased lots of ladybugs to eat the aphids in the garden. I planted garlic and onions (didn’t have a clue what I was doing). It rained, and I checked for bugs. Obsessively. I found holes on the leaves, signs of critters that ate their veggies. But I had declared a no-worm manifesto, and I was determined to win. You know where this is going, right? When the time came to serve—I had invited friends over—I opened the pot and screamed. There, fully steamed and swollen like a green hot dog on the top of my beautiful broccoli, was a humongous green worm. My friends laughed and encouraged me to toss the worm and eat the broccoli. I couldn’t, but I was told by those who did, that the vegetable was perfection. Plant, make sure I’ve done my best, and accept the results of whatever nature provides. Common sense for a great and anxiety free life. Oh, Sala, this entree entry was delicious! 1. Does doing your best mean you still get to rest? 2. That stuff really is perfection, eh?